Multivariate statistical methods are used to analyze the joint behavior of more than one random variable. There are a wide range of mulitvariate techniques available, as may be seen from the different statistical method examples below. These techniques can be done using Statgraphics Centurion 18's multivariate statistical analysis. 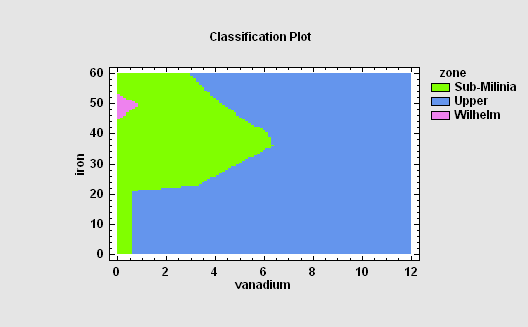 Matrix plots are used to display all pairs of X-Y plots for a set of quantitative variables. They are a good method for detecting pairs of variables that are strongly correlated. 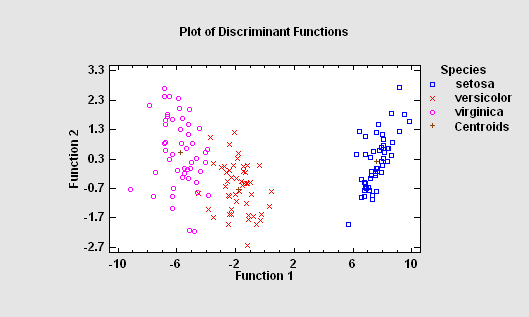 It is also possible to detect cases that appear to be outliers. The matrix plot at the right has two additions: 1. A box-and-whisker plot for each variable in the diagonal locations. 2. 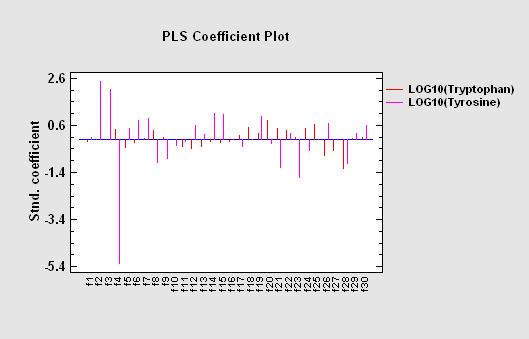 A robust LOWESS smooth for each plot, which highlights the estimated relationships between the variables. 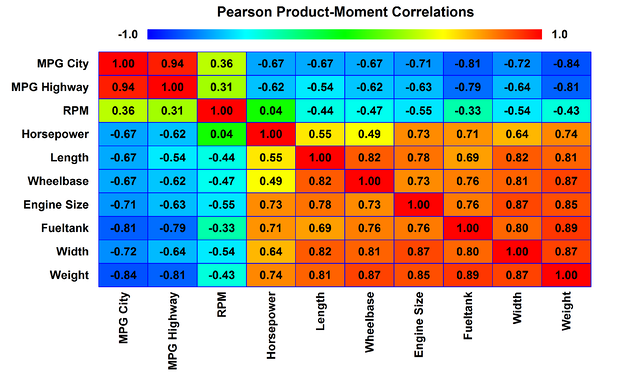 The Multiple-Variable Analysis (Correlations) procedure is designed to summarize two or more columns of numeric data. It calculates summary statistics for each variable, as well as correlations and covariances between the variables. 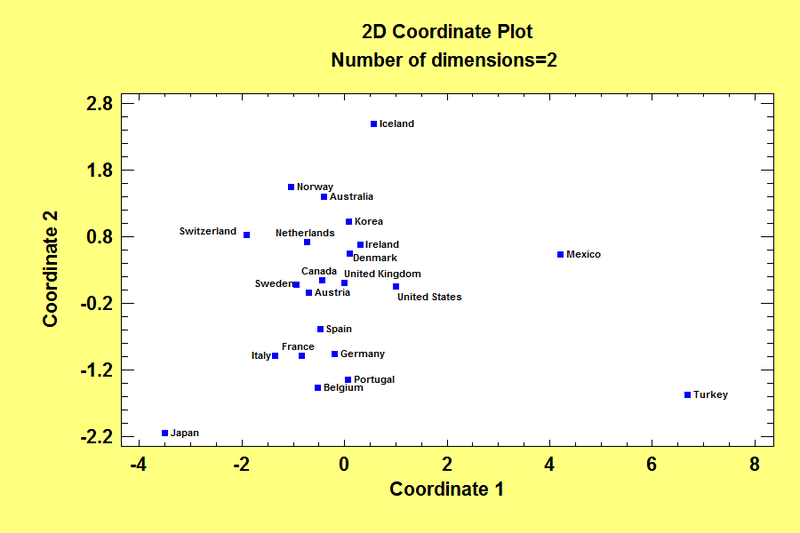 The graphs include a scatterplot matrix, star plots, and sunray plots. This procedure is often used prior to constructing a multiple regression model. 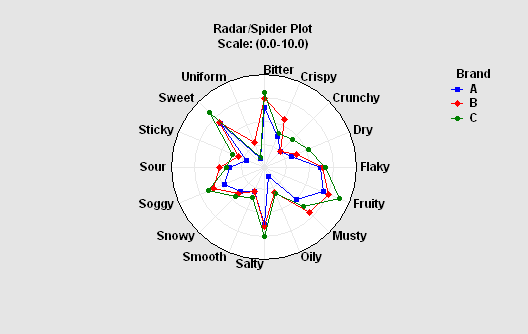 A radar or spider plot is used to display the values of several quantitative variables on a case-by-case basis. The plot at the left compares characteristics of 3 different brands. 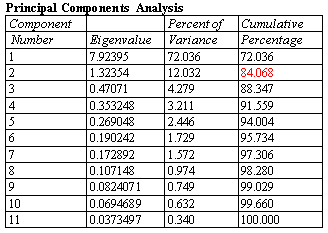 A principal components or factor analysis derives linear combinations of multiple quantitative variables that explain the largest percentage of the variation amongst those variables. 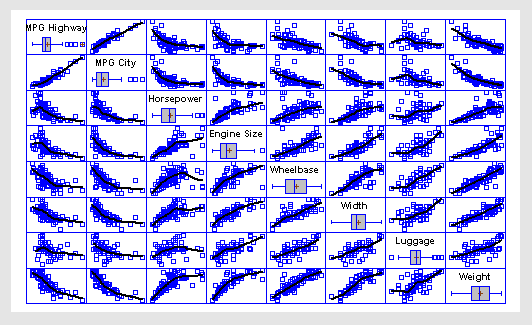 These types of analyses are used to reduce the dimensionality of the problem in order to better understand the underlying factors affecting those variables. In many cases, a small number of components may explain a large percentage of the overall variability. Proper interpretation of the factors can provide important insights into the mechanisms that are at work. A cluster analysis groups observations or variables based on similarities between them. 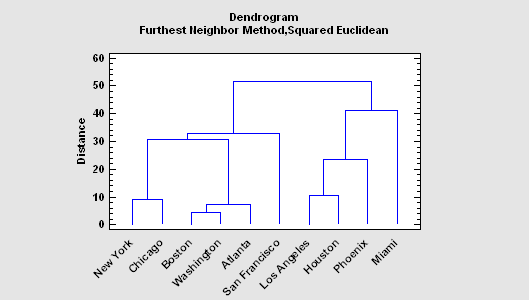 The dendrogram at the left shows the results of hierarchical clustering procedure, which begins with separate observations and groups them together based upon the distance between them in a multivariate space. 1. to be able to describe observed cases mathematically in a manner that separates them into groups as well as possible. 2. to be able to classify new observations as belonging to one or another of the groups. The Neural Network Classifier implements a nonparametric method for classifying observations into one of g groups based on p observed quantitative variables. Rather than making any assumption about the nature of the distribution of the variables within each group, it constructs a nonparametric estimate of each group’s density function at a desired location based on neighboring observations from that group. The estimate is constructed using a Parzen window that weights observations from each group according to their distance from the specified location. Partial Least Squares is designed to construct a statistical model relating multiple independent variables X to multiple dependent variables Y. The procedure is most helpful when there are many predictors and the primary goal of the analysis is prediction of the response variables. Unlike other regression procedures, estimates can be derived even in the case where the number of predictor variables outnumbers the observations. PLS is widely used by chemical engineers and chemometricians for spectrometric calibration. 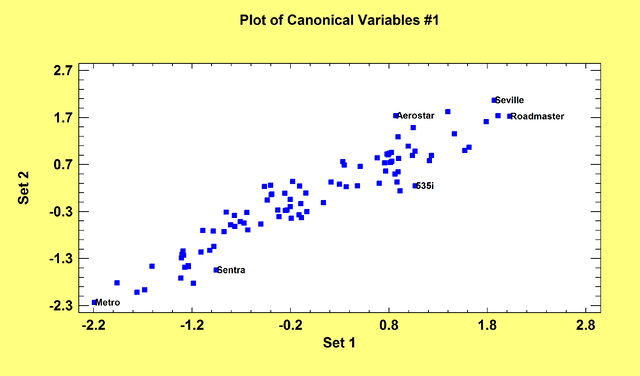 The Canonical Correlations procedure is designed to help identify associations between two sets of variables. It does so by finding linear combinations of the variables in the two sets that exhibit strong correlations. The pair of linear combinations with the strongest correlation forms the first set of canonical variables. The second set of canonical variables is the pair of linear combinations that show the next strongest correlation amongst all combinations that are uncorrelated with the first set. Often, a small number of pairs can be used to quantify the relationships that exist between the two sets. This procedure tests whether a set of random variables could reasonably have come from a multivariate normal distribution. 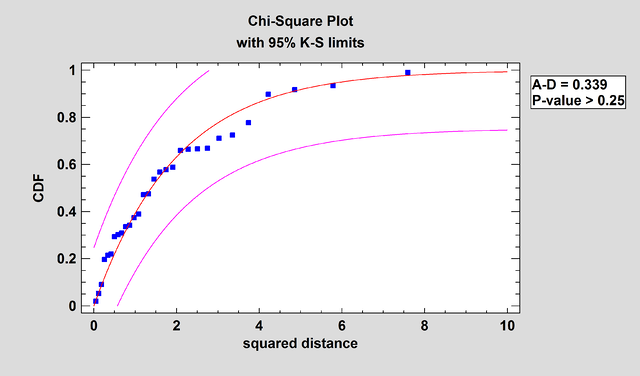 It includes Royston’s H test and tests based on a chi-square plot of the squared distances of each observation from the sample centroid. The Multivariate Tolerance Limits procedure creates statistical tolerance limits for data consisting of more than one variable. It includes a tolerance region that bounds a selected p% of the population with 100(1-alpha)% confidence. It also includes joint simultaneous tolerance limits for each of the variables using a Bonferroni approach. The data are assumed to be a random sample from a multivariate normal distribution. 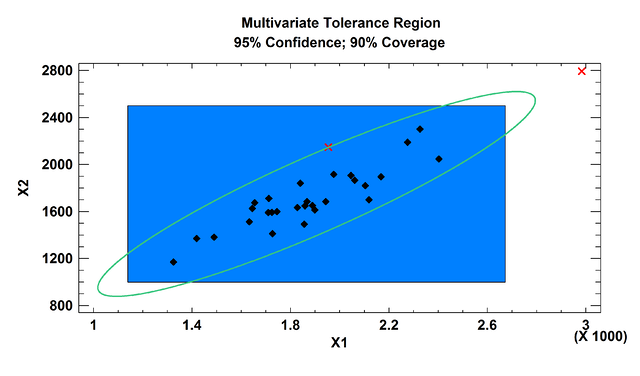 Multivariate tolerance limits are often compared to specifications for multiple variables to determine whether or not most of the population is within spec. The Multidimensional Scaling procedure is designed to display multivariate data in a low-dimensional space. Given an n by n matrix of distances between each pair of n multivariate observations, the procedure searches for a low-dimensional representation of those observations that preserves the distances between them as well as possible. The primary output is a map of the points in that low-dimensional space (usually 2 or 3 dimensions).